Concertgoers (and pets) enjoy the annual Concerts on the Quad series. From 1991 until 2004, Hoffman was the trumpet/flugelhorn soloist and composer/arranger with the Ray Charles Orchestra. His time with Charles took him all over the world, including an appearance with the Moscow Symphony Orchestra in 2000. Hoffman has also performed with the Los Angeles Philharmonic Orchestra, has appeared on television (“The Tonight Show” on NBC, “Live at Newport” on PBS, “Merv Griffin’s New Years Eve Celebration,” “The ABC 24 Hour Millennium Marathon,” and the Fox TV special “Ray Charles: 50 Years of Music”), and performed at most of the major jazz festivals. He has performed with Stevie Wonder, Gladys Knight, Michael McDonald, Randy Travis, and Willie Nelson and recorded with Paul Adams, Daniel Leahy, The Senses, the Stone/Bratt Big Band, the John Cooper Jazz Orchestra, Four Corners, and The Neurons. Hoffman joined the ISU Jazz Ensembles I and II on the Center for the Performing Arts stage this past November for a concert where he was featured on several selections and students performed some of his compositions and arrangements. David Hoffman and Friends will perform on July 31 during Concerts on the Quad series. 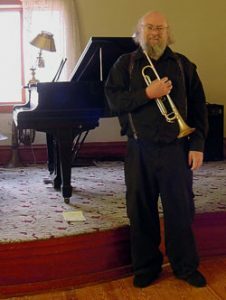 Hoffman teaches trumpet, jazz piano, and jazz composition and is the director of the Cherry Street Jazz Combo at Knox College. An Evening of Jazz is an annual Concerts on the Quad series favorite. Celebrating alongside of the Illinois Shakespeare Festival, this season marks the 40th year since the debut of the concert series, with jazz making its first appearance in the series in 1992. Then known as the Illinois Shakespeare Festival Monday Night Chamber Series and hosted on the Ewing Manor grounds, the series moved to the ISU Quad the following summer.